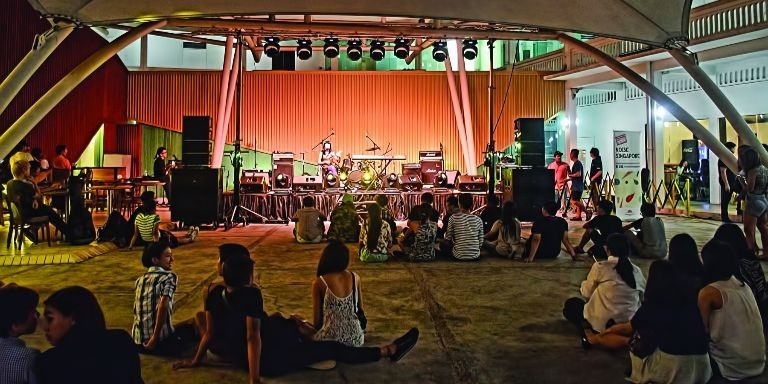 Open spaces were developed for public events such as the Singapore Night Festival, which attract both residents and tourists. Photo credit: Choo Yut Shing, CC by-NC-SA 2.0, https://flic.kr/p/oBisrW. Rapid urban renewal in the 1980s improved the quality of life in Singapore, but formerly bustling districts lost some of their vibrancy. To inject life back into the Bras Basah.Bugis precinct in downtown Singapore, the Urban Redevelopment Authority embarked on a 20-year rejuvenation plan in 1989. The plan aimed to bring life back to the streets by encouraging walking and developing a heritage, arts, and learning enclave. This case study was adapted from Urban Solutions of the Centre for Liveable Cities in Singapore. Bras Basah and Bugis are adjacent neighborhoods in downtown Singapore. Since the mid-19th century, Bras Basah has hosted many religious and educational institutions. Up until the 1970s, students thronged to its bookshops and cinemas. In contrast, Bugis was well known in the 1950s for its spirited nightlife. On Bugis Street, locals, tourists, sailors and, most famously, cross-dressers gathered to eat street food, watch people, or carouse till the wee hours. But like other inner city areas, the streets of both districts were congested, and the people were living in overcrowded housing with poor sanitation. To address these issues, the government started in the 1960s to demolish ubiquitous but dilapidated shophouses. Residents were relocated to improved public housing—sometimes within the area—while the land was redeveloped as offices, hotels, and shopping malls. Urban renewal efforts culminated in the 1980s. Most of the schools left, leaving empty structures behind, while Bugis Street was leveled to build the underground Mass Rapid Transit (MRT) system, marking the end of the street’s rowdy revelries. By the late 1980s, both districts had developed a new shine but were discernibly quieter and less vibrant. To revive the area, the Urban Redevelopment Authority decided to develop it into a lively heritage, arts, and learning enclave. The districts were branded as a single precinct called Bras Basah.Bugis or BBB for short. A master plan was drawn up to guide its development. A key strategy to enliven BBB was to get people to walk from place to place. Measures were explored to create a pedestrian-friendly precinct with welcoming, active, and vibrant streets. The vision was to link up BBB through a network of pedestrian malls, covered walkways, laneways between buildings, and even second-story links where street-level crossings were not possible, so that pedestrians could move around easily and comfortably. The earliest effort to create a pedestrian mall was in 1989, when the land above the new Bugis MRT station was sold for commercial development. The Urban Redevelopment Authority guided the developer to retain the three old streets that intersected Bugis Street in its shopping mall to promote pedestrian traffic and recapture the human scale of the original shophouses. These indoor streets were successfully integrated with the rest of the mall and kept accessible. Another significant initiative was the pedestrianization of Albert and Waterloo Streets. Home to prominent Chinese and Hindu temples, the two intersecting streets were often congested with cars and people, especially during religious festivals. In 1996, the converting of street sections into a 700-meter pedestrian mall began to provide a venue for festival markets and other street activities. This promoted a freer flow of people, adding color and bustle to the streets. Beyond pedestrian infrastructure, urban planners know that paths lined with shops and cafes are more walkable than paths without them. URA guidelines therefore stipulate that “activity-generating” uses such as retail, dining and entertainment are to be provided at the ground level fronting pedestrian thoroughfares along BBB’s main roads. Blue areas in the planning guidelines stipulate "activity-generating” uses along the streets of Bras Basah.Bugis (BBB) precinct to enhance the experience of visitors and passersby. Photo credit: URA online Maps service. As part of its conservation program from the late 1980s, the Urban Redevelopment Authority decided to retain BBB’s eclectic mix of heritage shophouses, schools, and places of worship, alongside modern high-rise buildings and public housing. Many BBB buildings were conserved, thereby preserving the identity, beauty, and human scale of adjacent streets. Former schools were also reopened as museums or other public facilities, which expanded and enriched the public realm. The former Tao Nan School building now houses the Peranakan Museum. Photo credit: Choo Yut Shing, CC by-NC-SA 2.0, flic.kr/p/oRUoLn. At the same time, arts and educational institutions were grouped into clusters by reserving several plots of land for them. As the student population grew, they injected more life and energy into the area. Planners and architects have also developed good public places at institutions like LASALLE College of the Arts, School of the Arts, and Singapore Management University. BBB institutions organize a rich calendar of events, including the Singapore Writers Festival and Singapore Biennale, which draws people into their semi-public areas. In the case of BBB’s eclectic and massively popular signature event, the Singapore Night Festival, activities can also spill into public spaces. The Wheel House performance during the Singapore Night Festival. Photo credit: National Heritage Board. Planners also took care to retain BBB’s public housing areas in the master plan. This local community contributes to the precinct’s authenticity and vibrancy, especially after hours. Three blocks of old public flats were also refurbished as a hostel for Singapore Management University's students. This created a youthful resident population, making for a livelier BBB at night. Today, BBB is a unique mash-up of old and new. Hipster cafes sit next to traditional coffee shops, or “kopitiams”; conserved shophouses are juxtaposed with high-rises. You are as likely to see arty young types as older Singaporeans who chitchat at kopitiams or read the papers at the National Library. The Waterloo Street Food Centre is a traditional coffee shop, or kopitiam. Photo credit: Toh Ee Ming. The Urban Redevelopment Authority continues to work with various partners to reclaim road space for people and events, especially those with potential to draw vibrant crowds. In 2013, a portion of Queen Street was narrowed by removing curbside parking to create expanded sidewalks with attractive seating and paving to encourage people to hang out. The wider sidewalks are also more conducive for arts and cultural events in the area. To encourage stakeholders to make BBB even livelier, the National Heritage Board led a series of visioning workshops in 2014 with 50 commercial and nonprofit organizations in BBB. They discussed future plans, such as allowing more regular activities that spill out onto the streets and public domains, such as busking. One suggestion to close off certain streets for the 2015 Night Festival was done to great success. This has since prompted the Urban Redevelopment Authority to consider closing parts of Armenian Street to encourage a vibrant street life. Centre for Liveable Cities. 2017. Bras Basah.Bugis: Breathing Life Back into BBB. Urban Solutions, Issue 11: Public Spaces. May 2017. The Centre for Liveable Cities, Singapore. CLC’s mission is to distil, create and share knowledge on liveable and sustainable cities. CLC’s work spans four main areas—Research, Capability Development, Knowledge Platforms, and Advisory. Through these activities, CLC hopes to provide urban leaders and practitioners with the knowledge and support needed to make our cities better. Visit the CLC website.